No one is expected to walk in and know how to use every piece of equipment, so as part of your membership, we include 2 FREE orientation sessions with SweatPT. 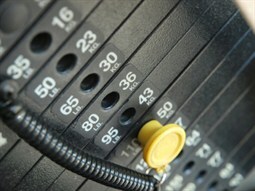 The orientation sessions introduce you to the gym and increase your comfort level with the equipment. They are designed to teach you how to use and set up each machine while using proper weight lifting form and technique. To set up your orientation sessions with a certified SweatPT personal trainer, simply contact the front desk at the location you use most frequently. Although men and women usually have different goals when working out, the beginning processes for both should be quite similar. A common misconception most people begin with is that men should do heavy weight and low repetitions, and women should perform the opposite; however, the first routine for anyone new to resistance training should be very similar. Because the first concern should be an injury-free program, a regimen based in conditioning the muscles and connective tissue (ligaments and tendons) for the rigors of training should be a priority. Also, developing core strength from the start will increase your overall progress by enhancing good posture, improving balance and coordination, and augmenting over-all caloric burn by utilizing more muscle tissue. Beginning an exercise program that is too advanced could easily result in abnormal soreness and injury, which generally leads to avoidance of the gym. Exercise may make you sore, but it should never be debilitating; proper form, along with strong stabilizing muscles and connective tissue should never result in injury. The following is a list of general guidelines to help you get the most out of your weight-training program. Make all adjustments on each machine before using. DO NOT try to 'max out' or go to muscular failure during your first few workouts. Gradually progress in weights and repetitions as the routine becomes easier. Do all exercises in a controlled manner. Keep good form and posture when performing exercises. Breathe as normally as possible, exhaling while exerting force. If unsure how to do an exercise, please ask the staff. Cardiovascular endurance is improved by doing aerobic activities. Aerobic means using oxygen. Aerobic activities include dancing, jogging, bicycling, stair climbing, swimming or any activity that involves large muscle groups for extended periods of time. To receive a training effect, the activity must maintain at least 60% of your maximum heart rate for 20 minutes and be done at least three times per week. Your maximum heart rate is computed by subtracting your age from 220. Cardiovascular exercise can be done more than three times per week and can be done on consecutive days; however, remember that rest is as equally important in achieving your desired results. Sometimes your body needs a break as much as you do. Each cardio workout session should consist of 5-10 minutes warm up, followed by 20-30 minutes of aerobic training and a five-minute cool down. The warm up period gradually increases the heart rate, which prepares the muscular and circulatory systems for the upcoming training period while helping to prevent injuries. To produce significant improvements in the cardiovascular system, the training period should consist of exercising for at least 20-30 minutes in your training zone (60-80% of your heart rate max.). After completion of the training period, gradually decrease your exercise intensity before stopping (avoid sudden stops). This cool down period allows the muscular and circulatory system to return to normal, which helps prevent dizziness, fainting, or nausea.